I don't know if you will be watching, but I definitely will be. This has got to be one of the most anticipated interviews in a long time for me. Oprah interviewed and Katherine and Joe at the family home in Encino, Ca. 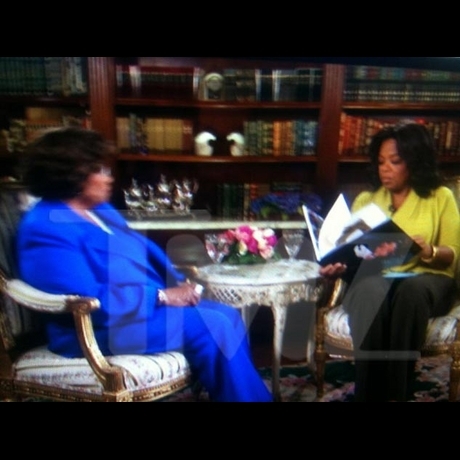 Michael Jackson's parents have scored an interview with Oprah Winfrey. Katherine and Joe Jackson sat down with the media mogul this weekend to film a segment for his talk show. TMZ said that the interview focused heavily on their late King of Pop son's life, kids, and the book Katherine put together about him. The interview was held at the Jackson family compound in Encino on Saturday. The website acquired photos of the meeting, where it can be seen Oprah meeting with several members of the Jackson family and getting a tour of the house.